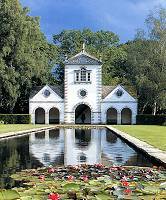 The garden at Bodnant is one of the finest in the world. It is situated above the River Conwy on ground sloping to the south-west and looks across the valley towards the Snowdonia range. The garden is in two parts. The upper part around the house consists of the Terrace Gardens as well as informal lawns shaded by trees. The lower portion, known as 'The Dell', is formed by the valley of the River Hiraethlyn, a tributary of the Conwy, and contains the pinetum and Wild Garden. In March and April masses of daffodils and other spring bulbs make a very colourful display. Pride of place amongst the shrubs is held by rhododendrons, magnolias and camellias - many of which were raised at Bodnant - which are in bloom from March until the end of June. The famous Laburnum Arch is at its best at the end of May and the beginning of June. The 'Chilean Fire Bush' Embothrium coccineum 'Norquinco' and many of the azaleas also provide a mass of colour during these months. In the summer months the Terrace Gardens are very colourful, with herbaceous borders, roses, water lilies, clematis and many unusual wall shrubs and climbers. In August and September, eucryphias and hyderangeas are a special feature, and later many of the autumn berrying trees and shrubs. An October visit is very worthwhile to see the splendid autumn colours. The vast collection of plants in the garden ensures colour and interest at all times. The garden was presented to the National Trust by Henry Duncan, Second Baron Aberconway in 1949, and is managed on the Trust's behalf by The Hon. Michael McLaren, Q.C. An outdoor attraction in its own right, the cedar-shingled pavilion seats 140 people. Visitors can partake of morning coffee, light lunches and afternoon teas from a varied menu of locally prepared food. Sweets and ices etc. are available from the confectionery kiosk adjoining the pavilion. Coach parties are welcome but we are unable to take advanced table reservations. The adjacent Garden Centre and Craft Studios (not National Trust) as well as containing all the plants currently on offer, is packed full of unusual and interesting items and gifts for gardeners and non gardeners alike. Eight miles south of Llandudno and Colwyn Bay just off the A470. Signposted from the A55, exit at Junction 19.